The Simeone Foundation Automotive Museum is one of the world's greatest collections of racing sports cars. Through our theme, "The Spirit of Competition", we celebrate the history and evolution of these magnificent machines. Assembled over 50 years by Dr. Frederick Simeone, the Museum contains over 65 historically significant cars including Ferrari, Alfa Romeo, Bugatti, Mercedes, Jaguar, Bentley, Porsche, Aston Martin, Corvette, Ford and more. Our world-famous "Demo Days" program is held on the 2nd and 4th Saturday of each month. These unique events showcase several museum cars in a themed presentation followed by a driving demonstration. The Simeone Foundation Automotive Museum is the world's most-awarded automotive museum by the International Historic Motoring Awards, having won 4 prestigious awards: 2011 Museum of the Year, 2012 Publication of the Year, 2014 Car of the Year and 2017 Museum of the Year. The perfect venue for all of your special events. 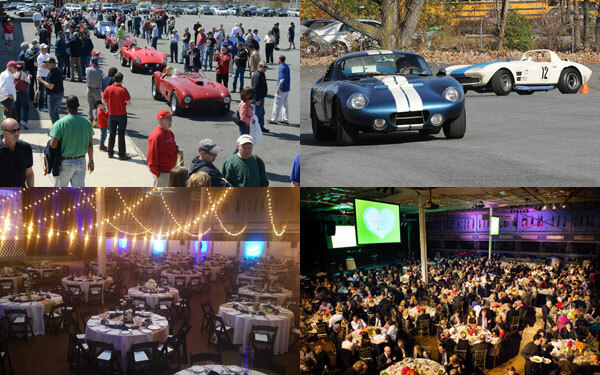 At 78,000 square feet, we are one of the few event venues in the Philadelphia area that can comfortably accommodate groups of 1000 people (seated) or up to 2000 people. We also have two upstairs conference rooms for smaller corporate meetings, sales meetings, seminars and luncheons. Free parking for hundreds of vehicles on our 3-acre parking lot. Our professional on-site catering team specializes in Weddings, Fundraisers, Birthday Parties, Corporate Networking Events, Corporate Meetings, Trade Shows, Bar/Bat Mitzvahs, Anniversary Parties, Retirement Parties, Sales Presentations, Car Club Meetings, Car Shows and more. Located just minutes from Center City, I95, PHL Airport and hotels.